Each week the children complete a craft page to take home. 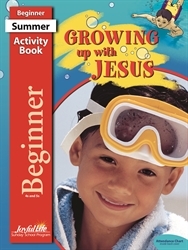 The craft activity reinforces and reviews the Bible lesson from that day. The Activity Book also contains individual Attendance Charts (inside back cover) and stickers (center insert) to be pulled out and kept separately. As each child arrives, he places the sticker on his attendance chart.